Publications are the currency of scientists. (Well, publications and extramural grants I suppose, but the two go hand-in-hand.) I am expected to be cranking out several papers in peer-reviewed journals each year, and each student’s research is geared toward the kind of rigor and care that it will be publishable. It is not enough to publish many papers, however. Our value as scientists has increasingly been judged by indicators of the quality of the papers we publish, and sometimes these indicators are given greater weight than the quantity published. 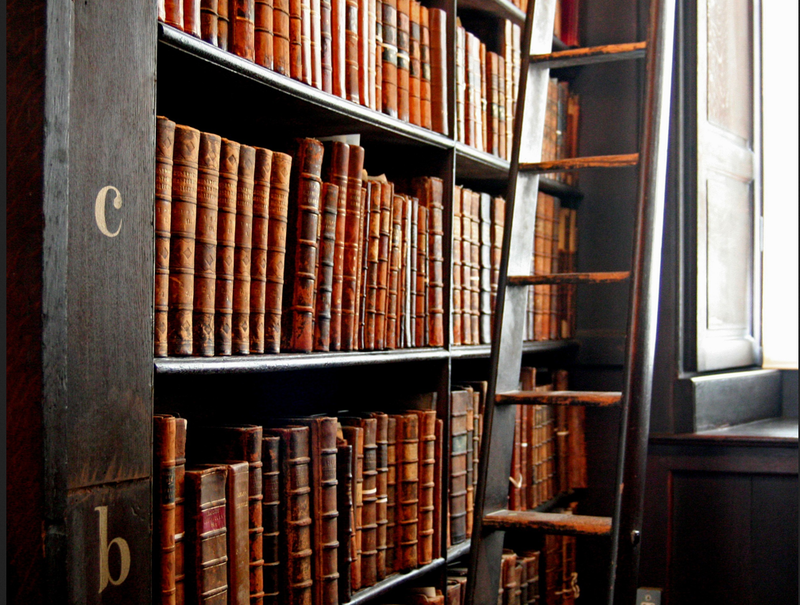 Trinity College Library, Dublin. Photo by Nic McPhee. The most commonly accepted indicator is the impact factor used in the Journal Citation Reports of the Web of Science to rank more than 8500 peer-reviewed journals covering all major disciplines of scientific endeavor. The basic form of an impact factor is to determine the rate at which papers published in a journal appear as citations in that and other journals. It makes sense that a journal that publishes papers that are rapidly used and cited in subsequent papers has an important impact. Conversely, a journal publishing papers that no one reads or that take many years to appear as citations in subsequent work is less relevant. A more thorough explanation of impact factor and its calculation can be found here. The use of impact factors to assess the quality of journals, individual papers, and the scientists who write them is controversial. There are many reasons why important scientific advances are not immediately appreciated, for example. Mendel’s work was overlooked for decades before it sparked a scientific revolution. His impact factor on Experiments on Plant Hybrids would have been pitifully low. There are also journals and researchers that engage in questionable practices designed specifically to inflate impact factors. Much ink has been spilled and many blood vessels have popped in discussion of the merit of the impact factor concept and its application; that is not my intent here. The fact remains that it would certainly be good for my career and those of my students to publish more papers in the most highly regarded journals we can. As a mentor, I look for opportunities to impress this fact on my students and get them into the habit of thinking about their highly focused investigations in the broadest light they can. We ornithologists are at a bit of a disadvantage, however. The historical development of our discipline included multiple societies, several of which have been publishing venerable journals for well over 100 years. The Ornithological Societies of North America (OSNA) is an umbrella organization of six societies, each publishing its own journal. For comparison, there is just one Journal of Mammalogy. Of course, we publish in other relevant journals too. The effect is that a contribution to an ornithological journal will almost certainly have a lower impact than a similar contribution to the Journal of Mammalogy, or indeed than a similar paper published in any number of broader ecological journals. “The System” is stacked against us, so to speak. This problem has been the primary impetus behind a highly controversial effort to strengthen ornithology in North America through targeted diversification of publication focus between the American Ornithologists’ Union’s Auk and the Cooper Ornithological Society’s Condor. 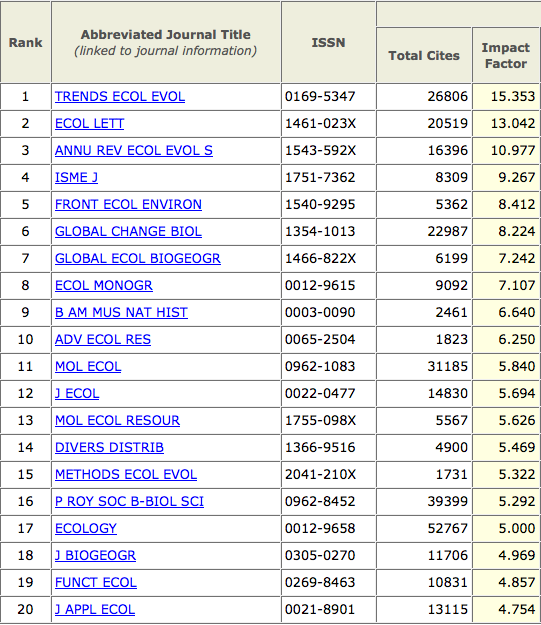 The following tables from Journal Citation Reports illustrate the scale of impact factors among relevant journals. 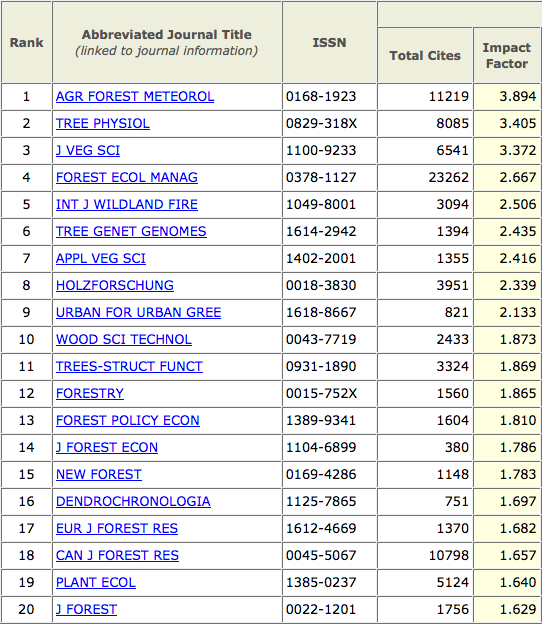 These are screencaps of the top 20 journals in each category sorted by impact factor, calculated through 2013. 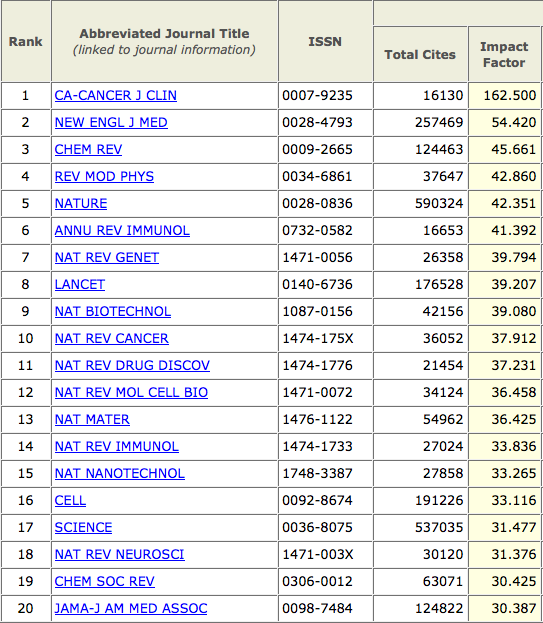 Not even Science and Nature can compete with journals on cancer research. Big spread, and most irrelevant to the work we do. The titles are more relevant. 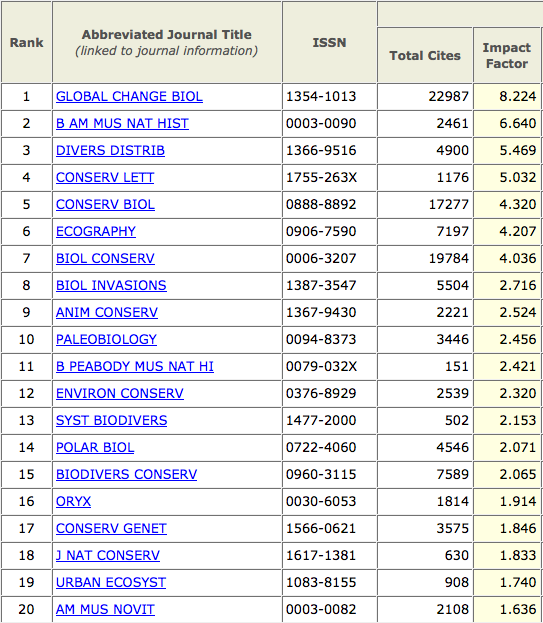 Note how far down the list is Ecology. 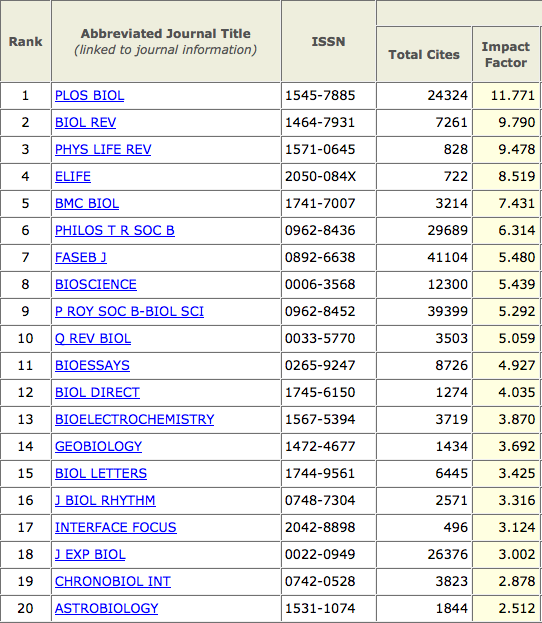 Some great journals here, and some tough places to publish. 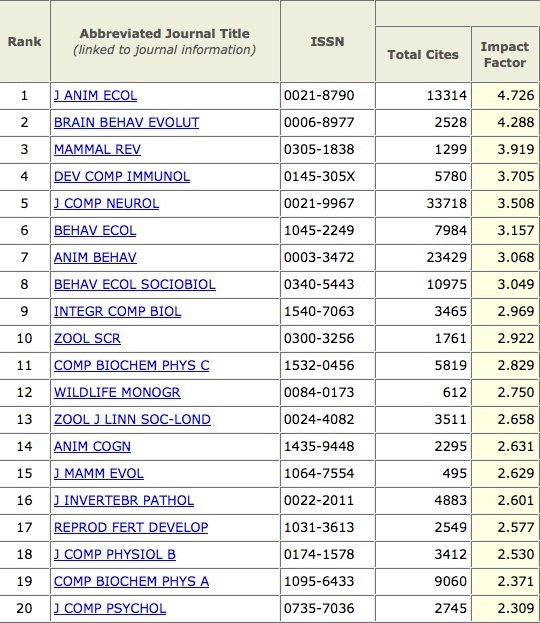 Journal of Mammalogy is #23 on this list; Journal of Wildlife Management is #39. Ouch. Even our best are quite low. It is clearly an uphill climb for a self-described ornithologist on the modern tenure-track. Given the range of impact factors, I am hard-pressed to have my students submit their work to journals with scores < 3.000, and I will encourage them to think first about journals >5.000. Sadly, this will mean discouraging them from publishing in ornithological journals, i.e., the journals that have lined the shelves of my office for more than 20 years. 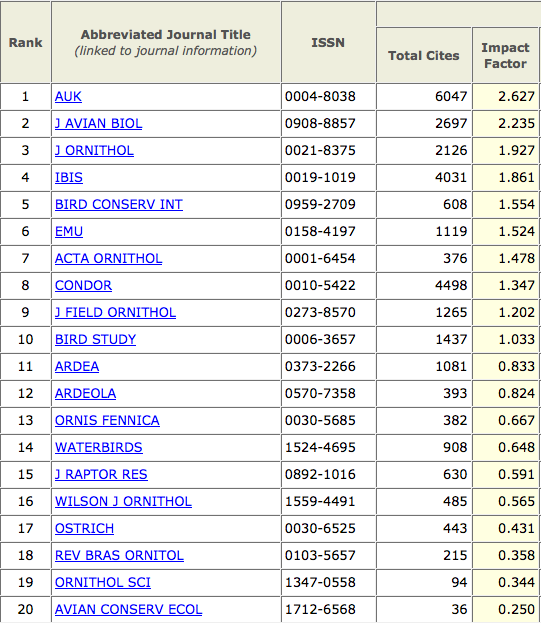 When we do submit to ornithological journals, we will concentrate on those with scores >1.500. We will always have work to submit to lower-tier journals, including regional and state-level journals, but it is also important to be strategic in presenting our work in its best possible light. 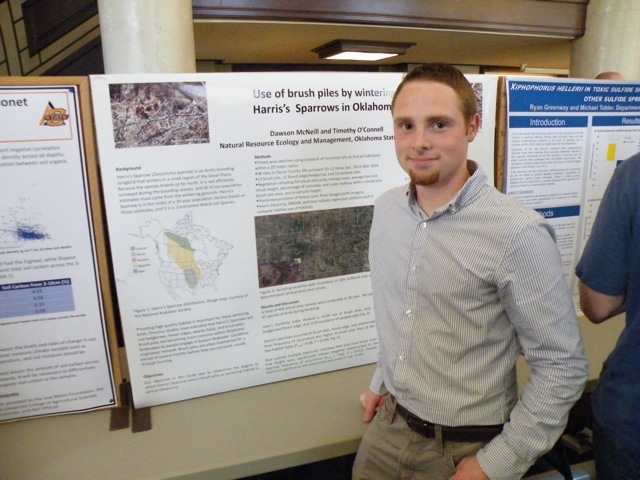 Dawson did a great job with his undergrad study of Harris’s Sparrow habitat use, but I don’t think we’ll submit it to Nature. This entry was posted in life and tagged citizen science, Impact Factor, mentoring, ornithology, OSNA, publishing, science, tenure track, Thompson Reuters, Web of Science, wildlife ecology. Bookmark the permalink.